Diane recently pointed me towards a potentially relevant manuscript: You are not allowed to view links. Register or Login to view. In the Madrid MS, all four men are facing front and holding hands in a strange way. There is also no text in the diagram itself. But I found the similarities with the VM circle too great to ignore. In both diagrams there are four concentric bands surrounding the four men. The centre is split in four (with lines or text) assigning each man his quarter segment. There's also divisions in the bands, although in the VM these are fewer. Likely someone with greater knowledge and skills than mine will be able to tell us what exactly this diagram represents (there's an accompanying text in the MS). I vaguely recall that something like this may have been posted before but wasn't able to find it. Also, on the left page there's a few more elements that recall of the VM drawings. These are more likely to be coincidences, but I will include them anyway. I feel much more confident about the relevance of the four-men diagram, but since these elements are on the page right next to it they may be worth noting. RE: Four half-men awkwardly holding hands inside four concentric bands. Interesting. Yet it is XIIth century, so if it inspired the VM, then it could have happened in a number of ways : either through another XIIth century era copy, or through a more recent one (i.e. XIVth or XVth century). Something like the four seasons surrounded by associated properties. There's a decent amount of text on there. Edit: searching further brought me to Stephen Bax's site, where this one was already discussed by Marco: You are not allowed to view links. Register or Login to view. 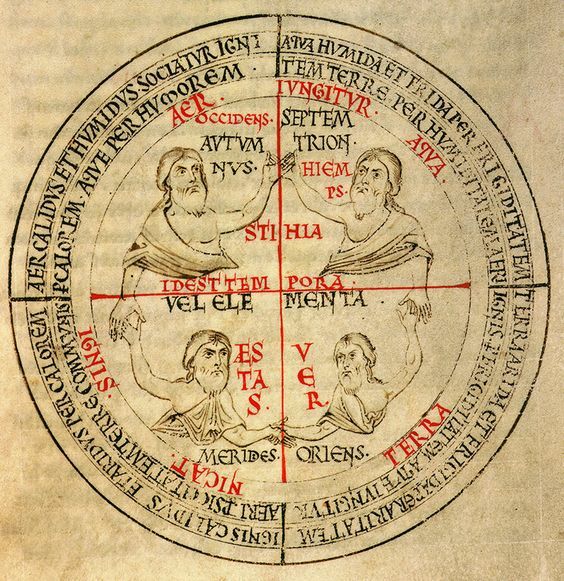 He said: "A diagram of the four seasons / elements / cardinal directions (Cava de’Tirreni, Bibl. della Badia, ms.3 S. Bedae, de temporibus XI Century, F. 203). I find the postures of the four figures partially comparable with those of f57v." In earlier copies of the text, like this one You are not allowed to view links. Register or Login to view. which I've just browsed entirely, that illustration is absent. So perhaps the txt is not too singificant, just the idea of 4 seasons. Incipit liber venerabit bedae presbiteri. de natura [should be a not is?] rerum. If we were to imagine a blend of that layout + the poses in the one linked last year by ReneZ You are not allowed to view links. Register or Login to view. , we might get something like what we see in 57v. (17-12-2018, 11:35 PM)Thomas_S Wrote: You are not allowed to view links. Register or Login to view. In earlier copies of the text, like this one You are not allowed to view links. Register or Login to view. which I've just browsed entirely, that illustration is absent. So perhaps the txt is not too singificant, just the idea of 4 seasons. I suppose the seasons illustrate Liber de temporibus. The "quadrifario opere dei" is something else, heavy theological stuff interpreted from Genesis. In the Cava de’Tirreni ms, the text explains the peculiar arrangement. For instance, the top-left quadrant: "Aer calidus et humidus sociatur igni / per calorem, aque per humorem" Air is hot and wet. It is related with fire by heat, and with water by humidity. Below, in red: "Aer iungitur aqua" Air is conjunct with water (but You are not allowed to view links. Register or Login to view. also means "to clasp hands"). The rationale is that each of the four elements is made of different combinations of two of the four Galenic qualities (hot/cold, wet/dry): couples of elements share a single quality (and opposite elements share none). This is cleverly illustrated by each element holding hands with the two contiguous elements with which it shares a quality. It seems three of the You are not allowed to view links. Register or Login to view. men don't want to contact to the fourth (top) one. Throughout the Middle Ages, there were schematic attempts to tie everything into one neat system that could be illustrated in the popular 4-8-12 diagrams. R. Lull was one of the important catalysts in representing information in a schematic way (often as trees or rota) and his ideas spread quite rapidly to manuscript diagrams. Liber Floridus is a good example of wrapping up related ideas (as they saw it) in neat round packages. As can be seen, some illustrators got the idea to represent them the same way as elements, in a rotum, with heads pointing outward. Those who were representing gravity also caught on to this idea and you start to see drawings of four humans standing at four points on the earth with a "hole" in the center into which a rock falls. Different concept with a similar visual presentation (in fact, often you have to glance at the text to know if it's a "gravity" picture or a "humors" picture). Houghton 101 also has some of the early schematic rota. Perpetual calendars and wind diagrams were adapted in this way, as well. In fact, wind diagrams have one of the longer histories of rotum representation, and may have inspired the development of some of the "elements" diagrams into rota as well. Even urine bottle diagrams were eventually organized this way. So... it seems to have been a fairly natural evolution in terms of the philosophy of "all things being related" and fitting into neat little Galenic boxes that some illustrations would be designed to consolidate concepts like "elements" and "humors" and " temperaments" into one diagram OR some of the illustrative figures from one might be borrowed to illustrate the other, since the two concepts were often within a page or two of each other in manuscripts.